Democratic Senator Hal Lindsay Arrested, Dies in Custody-Fiction! - Truth or Fiction? Democratic Senator Hal Lindsay Arrested, Dies in Custody-Fiction! Democratic Senator Hal Lindsay was arrested by the DEA over the weekend and was later killed while in protective custody. A self-described fake news website is behind false reports that Democratic Senator Hal Lindsay from New Jersey was arrested and was later killed while in police custody. And not only is the report false, there is no Democratic Senator named “Hal Lindsay” from New Jersey or any other state. New Jersey is represented by Senators Cory Booker and Robert Menendez, both Democrats. The bust itself yielded more than $6 million in finished drugs alone, never mind the plants and raw product waiting for packaging. All in all, Senator Lindsay is looking at 70 years behind bars on the opium alone. He was taken into custody at his office in Washington DC and has since been booked and released on $10 million bail. Lindsay’s office isn’t commenting on the ordeal but New Jersey Governor Chris Christie has already called for his removal and a special election as soon as possible. The loss of yet another seat, especially in the northeast, would be devastating to the Democrats. The Senator was in an undisclosed location enjoying a warm summer day for all anyone knew, until his protection detail realized his afternoon nap was going a bit long. They discovered him dead in a hammock of “natural causes,” citing a heart attack most likely brought on by the stress of the situation as the culprit. Lindsay, who was scheduled to appear in several courthouses and in front of Congress to give testimony against the Clintons in a drug smuggling ring involving their foundation’s cargo ships. Lindsey was given immunity for what he knew, which will now be buried right along with him. 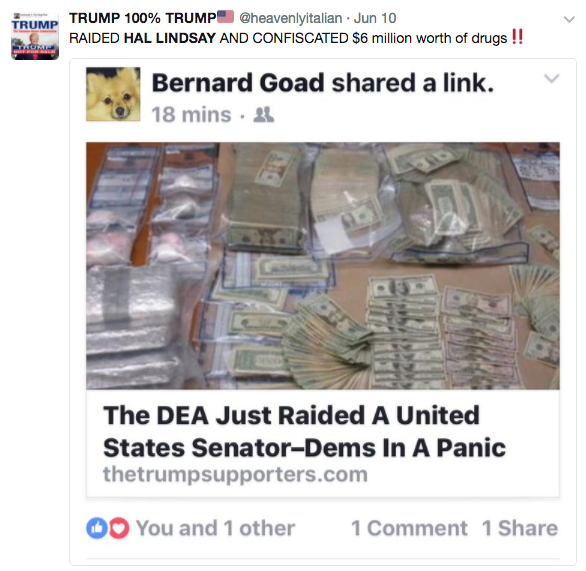 Fake news websites and social media users have helped circulate the false rumor that Democratic Senator Hal Lindsay was arrested.